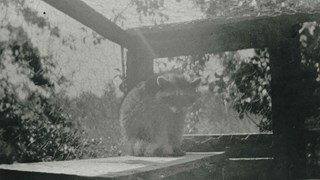 Photograph of a raccoon at the Fernhurst Game Farm, founded by Charles R. Gillmore near Imperial Street and Dow Avenue. This later became the site of Maywood Elementary School at 4567 Imperial Street. 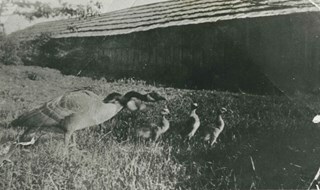 Photograph of Canada geese and goslings at the Fernhurst Game Farm. 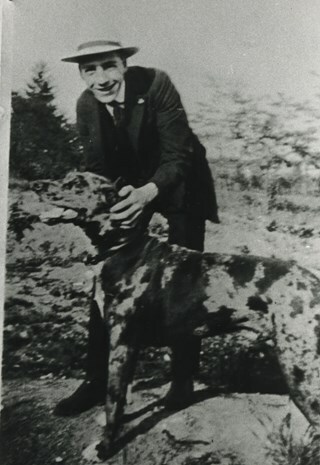 Fernhurst was operated by Charles R. Gillmore who later introduced Canada geese into New Zealand. This later became the site of Maywood Elementary School at 4567 Imperial Street. 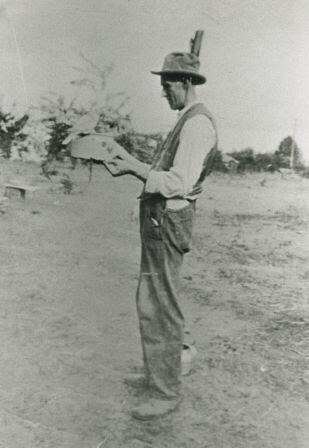 Photograph of Charles R. Gillmore, operator of Fernhurst Game Farm near Imperial Street and Dow Avenue. This later became the site of Maywood Elementary School at 4567 Imperial Street. 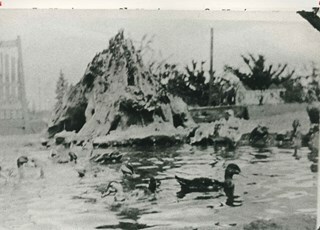 Photograph of a large pond for ducks and geese at Fernhurst Game Farm, operated by Charles R. Gillmore near Imperial Street and Dow Avenue. This later became the site of Maywood Elementary School at 4567 Imperial Street. Photograph of the Charles R. Gillmore family home at Fernhurst Game Farm near Imperial Street and Dow Avenue. This later became the site of Maywood Elementary School at 4567 Imperial Street. 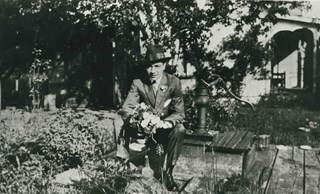 Note the water pump. Photograph of three firemen in the mist of extinguishing a fire at Maywood Elementary School. The fire gutted four classrooms as well as the school library before it was brought under control. 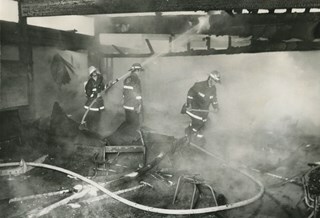 Newspaper clipping attached to verso of photograph reads: "SCHOOL BURNS... Burnaby firefighters douse the charred timbers of a classroom at Maywood Elementary School, 4567 Imperial, Burnaby, after an early morning fire gutted four classrooms and the school library. 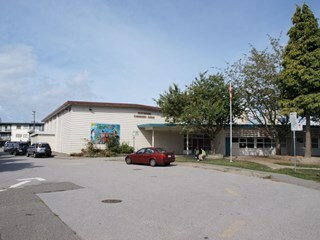 Cause of the two-alarm blaze is under investigation, but the fire is believed to have started in one of the classrooms. The fire was brought under control about an hour after being reported at 5:12 a.m."
Photograph of Maywood Elementary School.